The Michigan Urban Farming Initiative's headquarters and community center in Detroit. 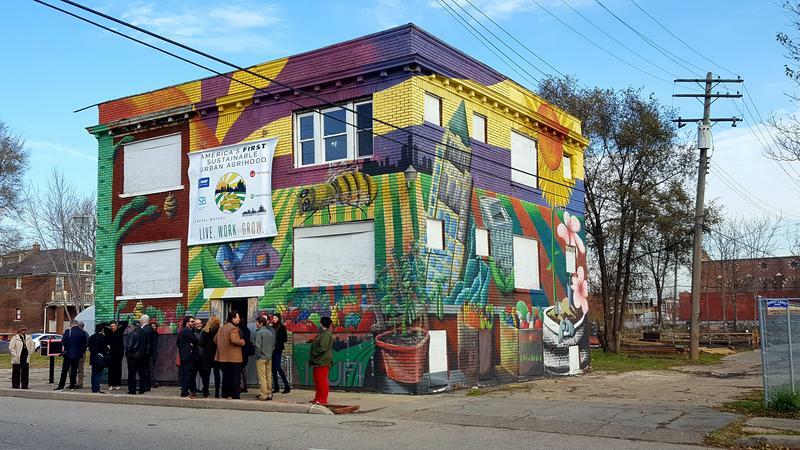 State economic development officials and a nonprofit urban farming group have launched a crowdfunded campaign to turn a vacant Detroit building into a community resource center. 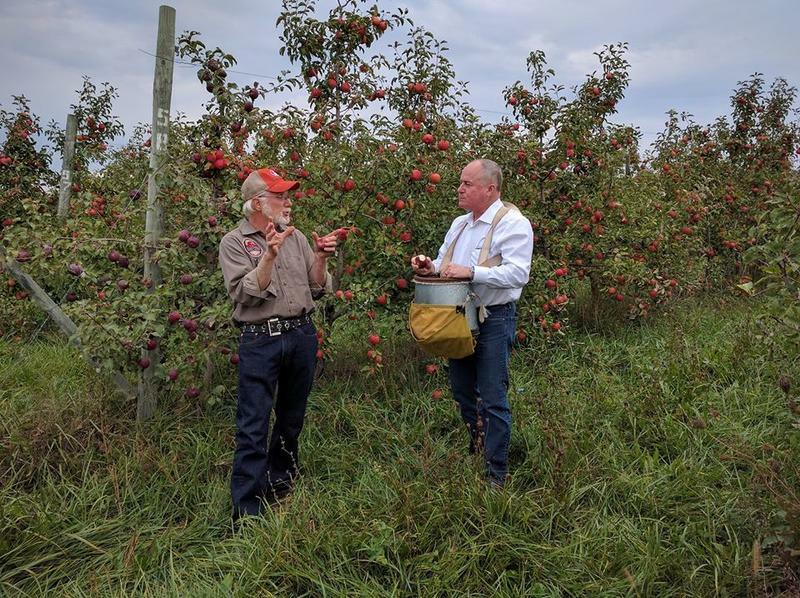 The campaign to raise $50,000 was launched Tuesday by the Michigan Economic Development Corp. and Michigan Urban Farming Initiative. Automotive supplier BorgWarner pledged $10,000 as part of the kickoff. The 3,200-square-foot center north of downtown will offer educational programming and event and meeting space. Two commercial kitchens will be constructed in the building and an adjacent healthy food cafe also is planned. The Michigan Urban Farming Initiative bought the building at auction. The restored building and cafe are expected to be unveiled in May. 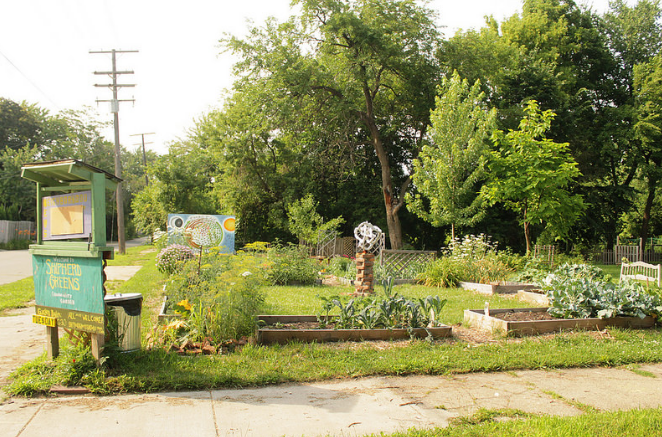 The two-acre urban garden features a 200-tree fruit orchard and provides free produce to about 2,000 homes. The Michigan Urban Farming Initiative, or Mufi, is debuting what it calls the country's first sustainable "agrihood" in Detroit. Tyson Gersh, the president and co-founder of Mufi, said aside from fresh produce, the urban gardens have provided volunteer opportunities and brought local investment to the area. Gersh said the community resource center will hold meetings, serve as the new headquarters for the initiative, and host educational programs and events. Our conversation with Val Dolcini, administrator of the USDA Farm Service Agency. The United States Department of Agriculture is reaching out in a special way to women and minority farmers and growers in Michigan. What’s behind this focus on “non-traditional” growers? And why is the USDA making its Michigan announcement in Flint? USDA Farm Service Agency administrator Val Dolcini joined us today to talk about the USDA's push to reach out to these "non-traditional" producers, and some of the challenges facing today’s farmers and ranchers. Private development has changed the face of Detroit. New restaurants, shops and houses have popped up in Midtown, Corktown and downtown Detroit. But what about public spaces? Our latest contributor to The Next Idea is Anya Sirota, an assistant professor of architecture at the University of Michigan. She’s also the principal of Akoaki, a practice in Detroit involving architecture, art and cultural infrastructure. Sirota believes there aren’t enough public spaces in Detroit that offer openness and the opportunity to build a sense of belonging. She thinks public space is crucial to the health of a city.